Allan Myers AC QC specialises in commercial law, constitutional and administrative law, corporations law, equity and trusts, petroleum law, property law, taxation law and trade practices law, and has appeared as counsel and arbitrator in many large and complex matters in courts in Australia and elsewhere. He joined Keating Chambers as an international member in August 2017. 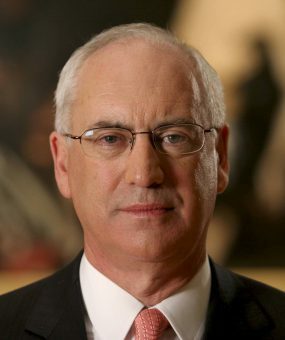 Allan was also leading counsel for the State of Victoria in the Bushfires Royal Commission (announced after the fires in February 2009 and commenced in April 2009). In the past 20 years, he has been an arbitrator or counsel in many international arbitrations concerning the construction of pipelines, road and rail infrastructure, petroleum facilities, mines and associated facilities. In the past four years he has been an arbitrator (including as chair of the arbitral tribunal) in substantial international arbitrations concerning the construction of mining and petroleum infrastructure and pipelines in each of which the amounts in dispute were in excess of $300m and, in one matter, in excess of $2bn (in which he is chair of the arbitral tribunal). His recent instructions also include one as the sole arbitrator in an arbitration concerning the respective entitlements to the Hides oil and gas field in Papua New Guinea and several other gas price arbitrations. In addition to his practice as a barrister, Allan has taught in undergraduate and graduate law courses in Australia (University of Melbourne), Canada (Osgoode Hall Law School, Toronto) and England (Oxford University) in the areas of equity, property law, taxation, bankruptcy and securities law. He has written many articles and delivered many papers in various areas of law and was assistant editor of the Australian Taxation Law Review for over ten years.